Scaffolding is an integral part of almost all construction projects and has been used ever since the first structures were built. Commonly needed to get access to structures at height during construction, scaffolding can serve many different purposes. Sometimes scaffolding is used to support workers and their tools, other times they’re needed to support significant loads from building materials, such as bricks, blocks, stucco, or cast-in-place concrete, which is known as ‘shoring’ instead of ‘scaffolding’. Why are there so many different types of scaffolding? Sometimes a specific type of scaffolding is common because the equipment is readily available and a lot of people know the system. You may already be familiar with these regional differences, like Kwikstage in Australia and Scotland, as well as tube and clip in England and Wales. There is a lot of local expertise on the intricacies of each system, as well as local codes written with these systems in mind. Depending on where you’re working in the world, different types of scaffolding systems will be more common. In Scandinavia and Northern Europe where labor is very expensive, aluminum scaffolding is becoming more common. Since aluminum is lighter than steel, and most scaffolding has to be manually lifted to be put in place, lighter scaffolding means that the scaffold can be built faster, which reduces labor cost. In some countries, aluminum is expensive and labor is much more affordable, so wooden poles and bamboo is fairly common. As a designer, make sure that you’re choosing the scaffolding system that works best for your project and follows local regulations. Below, you’ll find more information about each type of scaffolding including common applications and where they’re commonly used around the world. 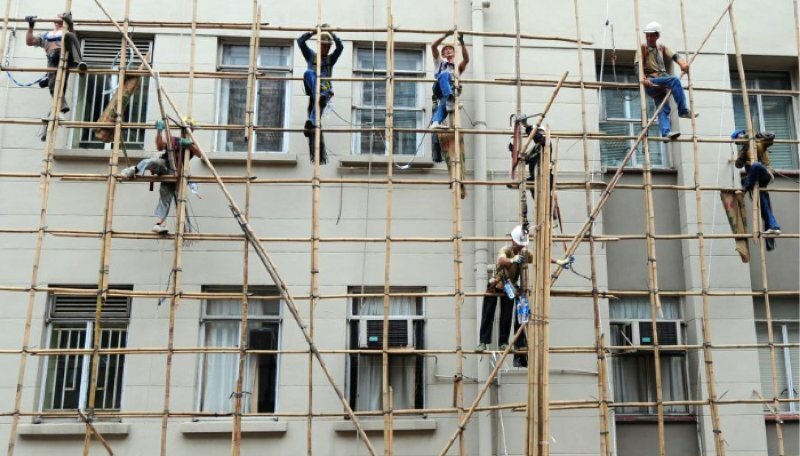 Although you can use wooden scaffolding almost anywhere (there are regulations for how to build it), it’s more common outside of North America and Europe. Pre-cut lumber was the most common type of scaffolding until steel, and the fabrication of materials, became much more affordable. Bamboo is more commonly used in Asia where it’s favored for strength, flexibility, and eco-friendliness. Hong Kong is the most well-known city that uses bamboo scaffolding to build everything from opera houses to skyscrapers. Highly-skilled designers and technicians are responsible for constructing and maneuvering through multiple stories of bamboo. It’s so popular that there is a formalized manual, from which the diagrams above were found, called the Guidelines on the Design and Construction of Bamboo Scaffolds. This is one of the earliest types of steel scaffolding and consists of two parts, including the tubes and clips, sometimes called ‘couples’. The idea is really simple and one reason why it’s so popular is because of the ease in assembly and disassembly. To erect the scaffold, you need to connect tubes together to make long runs and then connect the verticals and horizontals together with clamps built specifically for these tubes. This system is very flexible as you can place the verticals wherever you need them. Where other types of scaffolding don’t easily form to odd shapes, tube and clamp scaffolding can be adapted to round, straight, or irregular buildings. The steel in this type of scaffolding is specially designed to protect against rust and corrosion, meaning it’s a good choice for regions with harsh weather. 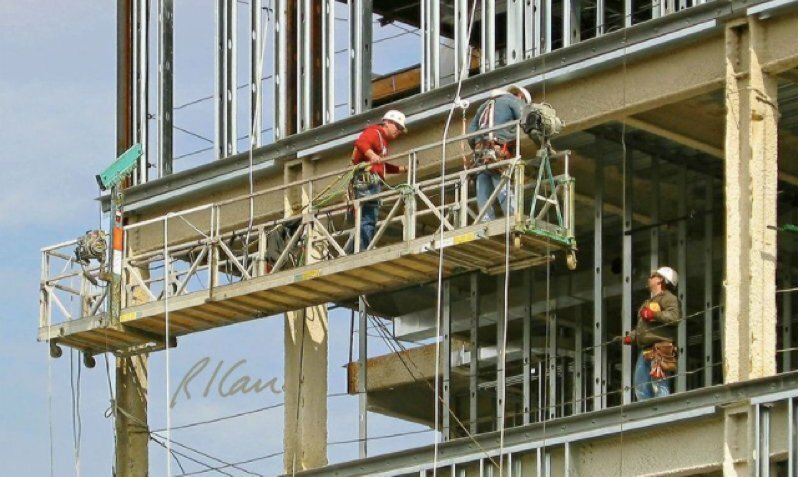 There are specific requirements that scaffold designers and companies must fulfill according to OSHA scaffolding safety regulations, which is where you’ll find more diagrams like the ones above. 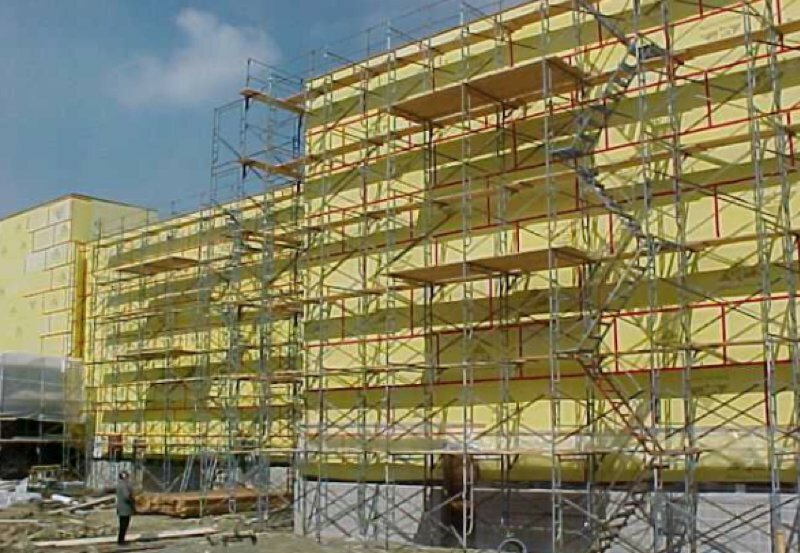 Sometimes referred to as modular scaffolding, systems scaffolding consists primarily of vertical and horizontal pre-engineered components that connect together in a systematic fashion. Systems scaffolding is likely the most used type of scaffolding across the globe and there are hundreds of manufacturers, each having specific efficiencies. Some perform well in very highly loaded conditions and others are more suited to smaller repeated scaffold structures. Commonly made from galvanized steel, cuplock systems scaffolding is popular for its ability to support heavy loads. With cuplocks at every 500mm to 1,000mm, this type of scaffolding creates highly standardized systems that work well for scaffolding designs with repeated patterns. 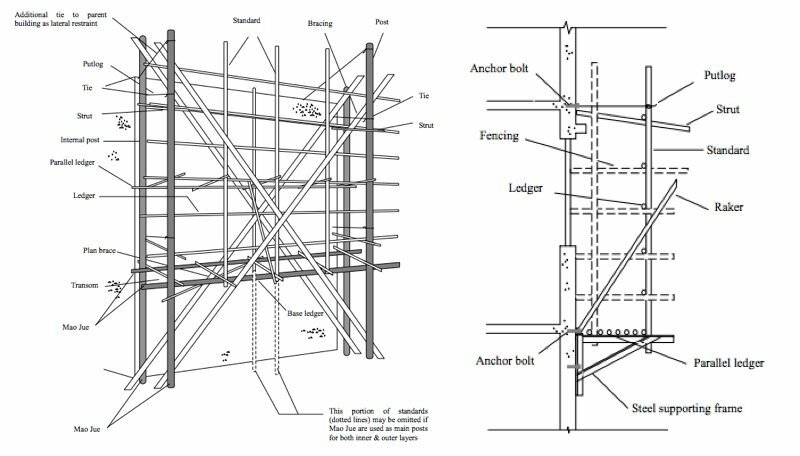 You’ll find many diagrams on cuplock scaffolding systems, as well as information on the different available sizes, like the ones above. If you’re a scaffold designer in the UK or Australia, then Kwikstage will likely be your systems scaffolding of choice. From commercial to residential applications, Kwikstage is both easy to erect and relatively adaptable. With just five components required, it’s easy to assemble and disassemble. Non-slip platforms and double guard rails included with Kwikstage improve its safety and reliability. There are plenty of resources out there for assembling Kwikstage scaffolding, including those from Work Safe New Zealand and Staluform. Used in scaffolding, as well as shoring and suspended systems, Haki is one of the more contemporary systems. 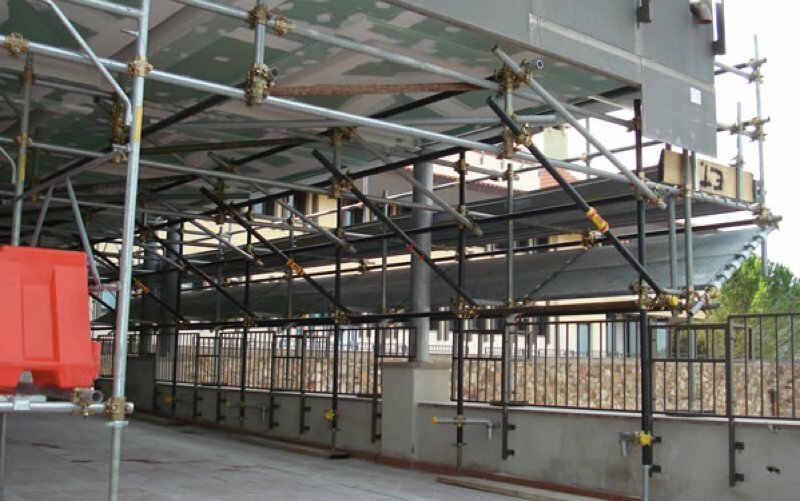 Unlike other scaffolding types, Haki is both a name for the manufacturer and a non-generic scaffolding system. Based on safety, quality, and adaptability, Haki scaffolding is lighter and has fewer components than other systems. The typical Bay length measures up to 3 meters and the system is approved for load class 6, making it into one of the more durable systems. You’ll find plenty assembly instructions and diagrams from Haki. 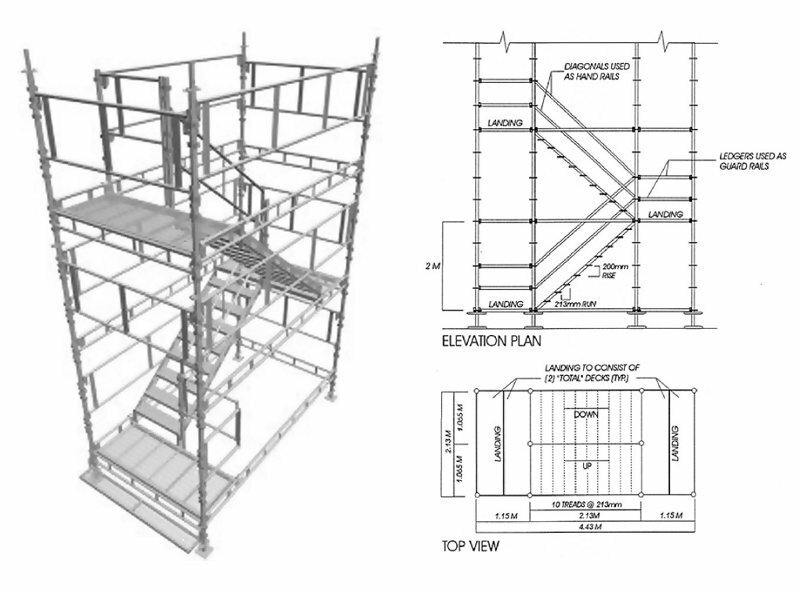 Most system scaffold manufacturers create special components that are used to build a staircase, like the diagrams above from Offshore Technology and Scaffolding Depot. 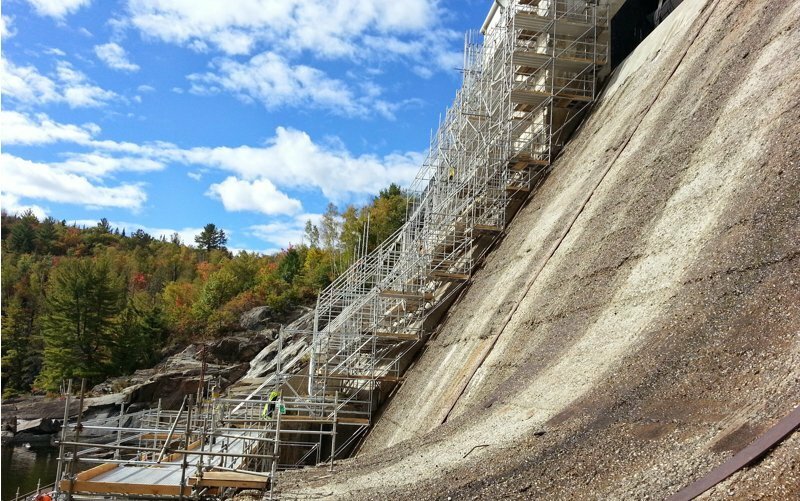 Oftentimes these staircases are a part of the scaffold structure that enable the workers to travel from level to level, but sometimes a stair tower is used on its own. As a scaffold designer, these particularly come in handy when workers need safe, temporary access to a section of the building. Very common for residential and commercial applications in North America and Europe, this type of modularized scaffolding consists of frames, braces, planks, and bases. This scaffold is very light and can be erected very quickly. It’s important to note that this type of scaffolding isn’t as strong as system scaffolding. In the diagrams above you can see the frames stacked vertically on top of each other, and the cross bracing that connects them together. 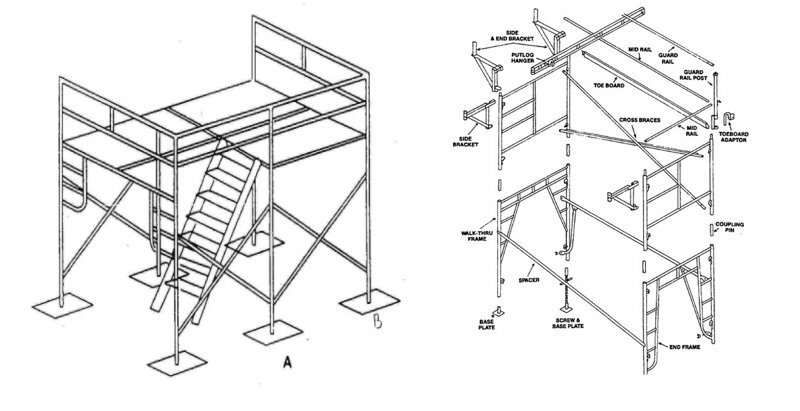 You can find similar diagrams from the Indiana University Scaffolding Safety Program and OSHA. Frame and brace scaffolding is commonly used in small-scale projects where scaffolding could be made mobile. Although some scaffolders don’t classify this structure as scaffolding, since it isn’t built from the ground, we consider suspended or swing set scaffolding as scaffolding. Afterall, it’s main purpose is to support scaffolders and their supplies. This type of scaffolding consists of a platform that is suspended by a cable system that allows the platform to climb up and down to various heights. 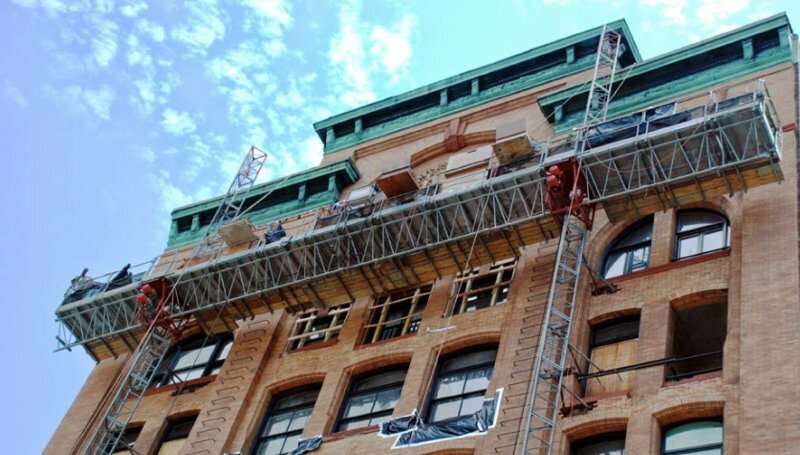 Suspended scaffolds can provide significant savings on very tall structures that need light duty access, like ongoing building maintenance and small improvements. You’ll find plenty of examples of swing set or suspended scaffolding online, like the ones above from Shandog Haoke Manufacturing Equipment Co. and Lackner Products Corp. Similar to suspended scaffolding, a mast climber can extend to various heights. Instead of hanging from wires, this scaffold can climb up and down on fixed mast structures that are placed on the ground. This type of scaffolding is favored by scaffolders who need to support heavy loads. Where there is a brick or block wall that needs to be built, you’ll oftentimes see mast climbing scaffolding as it can be adjusted to get to various heights in small increments. These scaffolds range in height, some only a couple floors tall while others climb several stories. Since mast climbers don’t require a significant amount of space at the base of the structure, they’re ideal for projects with limited ground area. Above is a great example of single and double mast climbing scaffolding from Tamer. Whenever you see a concrete slab for a building floor, the concrete was almost certainly poured on top of a form in order to hold the liquid concrete until it cures into a solid that can support itself. Most often the structure underneath consists of scaffolding. There are frame and brace systems that are manufactured to hold this weight, but it really can be built out of any available materials. You can find plenty of models and diagrams online, including the ones above from the Tokyo Institute of Technology. There are many different types of scaffolding that can be found worldwide. 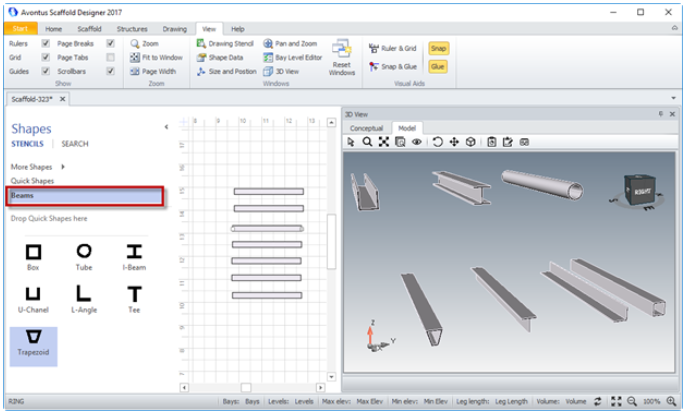 This list of scaffolding represents some of the popular types that we’ve seen designed with Avontus. There are other types of scaffolding you’ll find, including new frameworks that have yet to be created. 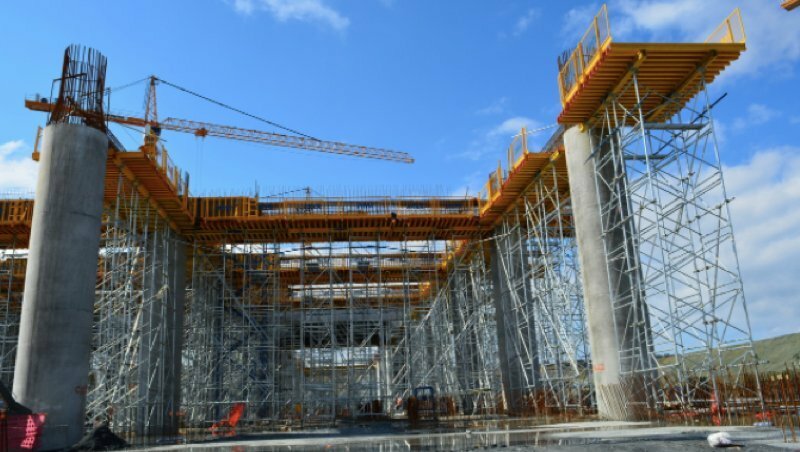 If you’re looking to learn about the basic types of scaffolding, then this list should give you a nice overview of what you’ll encounter in most construction projects in North America and Europe.